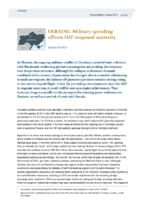 In Ukraine, the ongoing military conflict in Donbass, curtailed trade relations with Russia and weakening private consumption are pushing the economy ever deeper into recession. Although the collapse in domestic demand combined with currency depreciation has brought about a marked rebalancing towards net exports, the balance-of-payments pressure remains strong owing to the current capital flight. Under the prevailing circumstances, were the GDP to stagnate next year, it could well be seen as a major achievement. That, however, hinges crucially on the prospects for a lasting peace settlement in Donbass, as well as a revival of trade with Russia.